Results for - The fine line between "doing for" and "chores"
Think about kids from ages 10-18, thanks! 1. Growing up, I lived with my Grandparents, my Mom, my Mom and Stepdad, and my Stepdad. I only had chores with my Mom, my Stepdad and Grandma waited on me (and my 2 brothers) hand and foot. 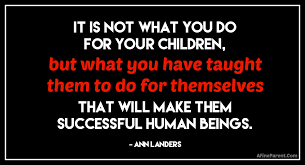 I feel the message I received was that it is a parent's duty not only to serve but to teach. So, when I had my kids I mostly waited on them, they had a bit of chores, and I taught them how to do everything around the house for when they would be on their own. (Drove my ex husband nuts.) Today, my brothers and I are hard workers, have a good work ethic, independent, etc; same goes for my kids. Do you believe that you can do about everything, as I did for my kids, and they'll be successful living on their own, when married, and a parent? 2. When my daughter was in choir there were times when she would be gone for a couple of days to a week for competition. I did all of what she needed to do for her, same for when my son was involved in drama or on vacay with his Dad. Would you do the same? 3. What were the rules in your house growing up in terms of the work load? 4. If you have children, are you raising them the same way that you were raised in terms of what you do for them and what they do? 5. My ex and I had huge cultural issues, who knew it would be like that? Growing up he saw the women do everything while the men just tended to their careers. I ran an equal opportunity household (meaning if your hands and legs aren't broken, then you need to contribute). He felt that my kids should've been doing more for themselves because it's what he saw growing up. If you had a split was it due to cultural differences?